6 MM 4-sided Heavy Duty Steel making it impossible to break. Cut resistant steel can discourage theft and resist cuts. The high quality cylinder provides protection from pickers, pullers and drillers. 43 Inch (110 cm) Long Chain can lock several bikes in the same time. Ideal for bicycles, ladders and sports equipment or tool boxes. Protect your property safe and secure. Perfect for locking your bike to a rack, tree or railing. Durable dust-proof nylon sleeve cover prevents scratches. • Bikes, bicycles, motorcycles. Perfect for locking your bike to a rack, tree or railing. • Ladders and sports equipment or tool boxes. BV® promises 30 days money back guarantee with 1 years free replacement warranty. Heavy Duty and Cut Resistant Steel Chain- 6 MM 4-sided steel chain discourages theft and resists cuts. High Quality Cylinder with Dust Cap - The high quality cylinder protects your belongings from pickers, pullers and drillers. The dust cap protects cylinder from getting rusty and extends its lifespan. 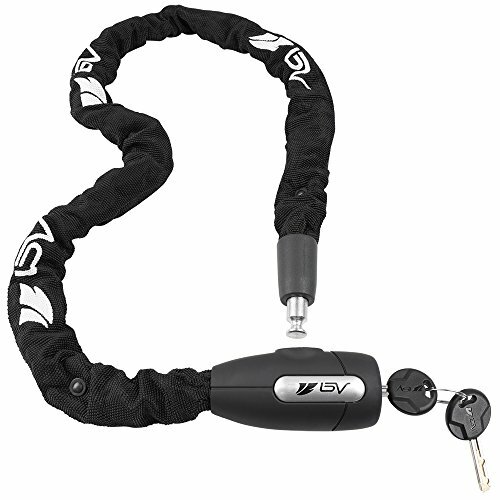 43 Inch (110 cm) Long Chain - Can lock several bikes in the same time. It can also be used on motorcycle. Multi-purpose - Ideal for bicycles, ladders and sports equipment or tool boxes. Protect your property safe and secure.Perfect for locking your bike to a rack, tree or railing.